There was a period in my life when I was a scorner. I do not say that proudly. I say it with great sadness and shame. When I became a scorner, it didn’t happen overnight, and most people who knew me probably had no idea; but my parents knew. My Sunday school teacher knew. My youth pastor probably knew. My close friends knew. My younger siblings definitely knew. I could make a list of excuses a mile long, but the truth is that I came to a point in my life that I decided I wanted to do what I wanted to do, and I didn’t want anyone to tell me anything different. I didn’t want anyone trying to offer me counsel, or logic, or correction, and I certainly didn’t want them to use the Bible to tell me why my decisions might be unwise. I am thankful that this period in my life wasn’t lengthy, but I regret that it ever happened at all. I cannot think of one positive thing that happened as a result of my attitude, and it grieves me greatly to think of the many negative things that happened because of it. I am thankful for parents who kept telling me the truth, kept praying for my spiritual welfare, and who were willing to forgive me when I finally “came to myself”. I am thankful that the Lord was faithful to continue to put people in my path who were willing to confront me, to correct me, and to be concerned for me even when I “scorned” them for it. When I look back to that time, I thought I was doing what would make me “happy”, and yet I remember those days as some of my most unhappy. I was angry a lot. I felt guilty a lot (and rightfully so). I was selfish and miserable. If I could encourage one person, young or old, to avoid that path entirely, or to get off of it if they’re on it, then sharing these thoughts will not be in vain. God has nothing good to say about the scorner, but I am thankful that He can forgive and change even a hard heart. 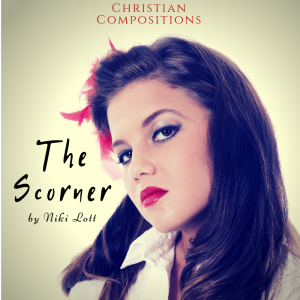 The key to the scorner changing is a willingness to humble themselves, repent of their sin, and allow God to change their heart toward Him, toward themselves, and toward others. A scorner, according to the Bible, is someone who is full of pride, and who uses mocking and shame to justify themselves, and to manipulate and try to control those who correct or rebuke them. The person they scorn may be someone who verbally reproves them, or it may simply be someone whose life and actions are a silent reproof to them. God says that the scorner hates the one who reproves them (Pro. 9:8; 15:12). They refuse to hear rebuke, correction, or counsel (Pro. 13:1). They are the ultimate rebel. They have decided that they are the final authority in their lives, and anyone who challenges or contradicts them becomes the object of their scorn. They are angry and proud of their anger (Pro. 21:24). A scorner loves and craves an audience. Although they may mock someone privately, they are empowered by the approval, sympathy, and praise of others. Their mocking may cause people to laugh, but it is not a laughter that brings joy; rather, it is one that gives pain. Scorners are often popular because their irreverent attitude and disrespect bring a guilty pleasure to many (Pro. 16:9). They appear a champion to some because of their willingness to challenge authority. Their ability to turn everything into a joke can make them the life of the party, or the class clown. Because they usually have a quick retort or sarcastic remark in any given situation, their wit may be mistaken for wisdom by those who are not discerning. Scorners are often friendly, helpful, and outgoing, especially to those whose loyalty they seek; but, beware if you challenge their opinions or confront their sin. Those who are in a position to train, teach, or lead them are usually the only ones who know their true character, because they bear the brunt of their disdain. No matter how loving the reproof, how right the rebuke, how sacrificial the investment, the reprover will never be loved by the scorner (Pro. 15:12). and a taunt for their tears (Pro. 30:17). and rarely accept responsibility for their own actions and faults. They are sympathetic and supportive of rebels, and sarcastic and scornful to authorities. As they grow older, they often seek positions of leadership or instruction, because they consider themselves to be always right. They sincerely value no one’s opinion but their own, or those who agree with them. Because of their attitude and anger, they often have family and other relationship conflicts (none of which they believe to be their fault) (Ps. 55:12-14). Though they may speak of peace, they do not seek conciliation, but rather control. Through their taunting, and desire to “bring down” those who correct or confront them, they will magnify flaws, mock failures, and misrepresent the motives of those they scorn. They may ask questions, but not because they genuinely want an answer (Pro. 14:6). Rather, they see responses as a means to gather ammunition, or to gain an audience. They will misquote the words of those they scorn, misunderstand their best intentions, and publicly malign their character. They are often outwardly religious, but they despise those who are genuinely righteous. Throughout the Bible, you will rarely find an account of a good and godly man, prophet, or king who did not have to deal with scorners, often in their own family. Joseph was mocked by his brothers. David was mocked by his brother, by his enemies, and by those he thought were his friends. Job was mocked and falsely accused by his friends. Nehemiah and the builders were mocked by their enemies. Jeremiah was mocked by the people of Judah. Hezekiah and the men of Jerusalem were mocked by the Assyrians. Noah was mocked by those of his day. Elisha was mocked by the village children. Moses was mocked by the children of Israel, and by his own brother and sister. Jesus was mocked by the Pharisees, by the priests, by those who doubted his abilities, and by those who crucified Him. Although these were godly men, and even God in the flesh, these scorners mocked their dreams and their decisions. They mocked their message and their methods. They mocked their looks, their labor, and their lives. They mocked their sorrow and their suffering. As difficult as it is, we need to realize that even if (and sometimes because) we attempt to follow the Lord to stand for the truth, and to live holy lives, we are going to face scorners. We should desire to never be found sitting “in the seat of the scornful”. Determine with God’s help not to be a scorner! Stay humble. Receive counsel and instruction. Refuse to mock those who are in authority over you for any reason. Along with that, determine never to listen to a scorner. When someone begins to mock, stop listening! If you do not, they will use your approval as their justification. If you choose not to sit in the seat of the scornful, you may stand alone for a while. Jeremiah did (Jer. 15:17). David did (Ps. 26:4-5). Paul did (II Tim. 4:14-16). Our precious Lord Jesus did (Mt. 26:56, 67-68). A scorner will do their best to isolate the person they scorn. They will seek to gather support for themselves, and to turn family, friends, and anyone else they can against that person. Sadly, I have watched scorners turn the hearts of children from their parents. I have watched scorners turn the hearts of new believers or young Christians against a pastor or other spiritual leader. I have watched scornful wives turn their own children against their father, and turn a godly husband away from the Lord. I have watched scorners discourage the hearts of children and teens who are trying to do right as they mock them for “being good”, or making spiritual decisions. I have watched scorners mock the man of God, usually the same man who won them to Christ, who has counseled them, taught them God’s Word and ways, and prayed for them. I have also grieved as I have observed good men and women compromise what they know to be right in an effort to gain the love or respect of a scorner. It never works. If you relinquish your principles or convictions to appease them, they will still mock you (although maybe not to your face) for not being what you said you were in the first place. What is worse, even if you gain some level of standing with the scorner, you will have to trade it for standing for the Lord. If necessary, cast them out. What does that mean? It does not mean you stop loving them. It does mean that if possible, you should remove them from a place of influence – in your home, your church, your class, your work. Sometimes it is the only means of stopping strife and contention (Pro. 22:10). At some point, be silent. Don’t argue or attempt to reason with them. Don’t try to answer all of their charges, or to defend yourself against their attacks. It is impossible. Hezekiah instructed the men of the city not to answer the taunting of the wicked Rabshakeh (II Kings 18:26-36). The Lord Jesus stood silently before His accusers and mockers. Commit yourself and your reputation to the Lord (Isa. 53:7; Mt. 27:14, 29-31, 39-44, 48-49; I Pet. 2:11-12, 15, 18-25; 3:1-2, 9-10) . Pray for them. We are commanded to pray for those who despitefully use us, and falsely accuse us (Mt. 5:11-12, 44). Pray that God will soften and humble their hearts, and that they will repent and be right with Him. Pray for yourself. Pray for the Lord to keep your heart tender. As Nehemiah, Hezekiah, David and many others did, take their taunts and accusations as well as your wounds to the Lord. Ask Him to defend you, and remember that He is keeping the records. As I mentioned earlier, the scorner has a great desire to build alliances and seek approval. They may come to you looking for “counsel”, or “comfort”. One of the best ways to discern if someone is genuinely seeking counsel (and not just looking to gain allies) is by listening to their attitude more than their accusations. Do they have an attitude of reverence and respect toward God and other authorities in their life? Do they mock or show contempt for parents, husbands, teachers, pastors, or other authority figures? Be very careful about sympathizing with a scorner. Also, be very wary of friendships or relationships with scornful people. Young lady, if a young man will mock his parents, his teachers, or his pastor, I promise you that if you marry him, one day he will mock you. Young man, if a girl will mock someone in her class who is seeking to live for God, or will mock her father or mother, be certain that if you decide to live for God that will eventually be her attitude toward you. If a wife will scorn her husband, she will eventually mock her pastor. A scorner is no respecter of persons, because they respect no one but themselves. Can a scorner change? Yes! A scorner can humble themselves and repent, and that alone is their hope. During my rebellious and scornful period, my dad sent me to a mission camp. Although earlier in my teen years I had surrendered my life to serve the Lord, I had my own agenda at this point. I was so angry with him for making me go. I cried. I tried to contrive ways to get out of it. I told my friends and my siblings how horrible my parents were. I left my mother in tears when they dropped me off, and I really didn’t care. They left, and they prayed. Thankfully, they did not give up on me, and neither did the Lord. God broke my selfish, scornful heart and my stubborn will that week. The first thing I did when my parents came back to pick me up at the end of that week was to ask their forgiveness. I’m forever grateful that my parents didn’t give in to my selfish demands. I’m so glad they didn’t just try to “make peace” with me, and abandon what they knew was right because I was so obstinate and unhappy with them. I later went to talk to a Sunday school teacher who had very kindly confronted me about something in my life. He had simply asked me if I thought the Lord was pleased with some of the choices I was making, and he asked what my parents thought about those choices. I hated him for it at the time. I didn’t mock him to his face, but I did behind his back. How it shames me to think I behaved in that way! When I got right with God, I went to that teacher and thanked him for caring enough about me to talk to me about my decisions, and asked him to forgive me for my attitude. I look back and realize that the people I despised the most then were the only people who truly loved me. All those “friends” and supporters I had were not really my friends. Some just didn’t know better, but some did. Those who encouraged me in my disobedience, who sympathized with my disrespect, and who laughed at my derision didn’t really love me at all. The people who would stand with tears in their eyes and face my taunts to tell me the truth – they were the ones who actually loved me. I found out that when I decided to follow the Lord with all my heart all those other “friends and sympathizers” sort of faded off in the distance. Some treated me with the same ridicule and disdain that I had displayed toward my parents and spiritual leaders. I’m sure I deserved it, although not for the reasons they had. I share all of this to remind us that any of us have the potential to become a scorner. Scorners are not just children or teenagers. Often, they’re angry, bitter adults. They’re unsubmissive wives and unspiritual husbands. They’re disgruntled church members, and discouraged pastor’s wives. They can be found in a myriad of other forms and faces. The common thread is a willingness to ridicule others to avoid personal reproof or rebuke. It’s a willingness to shame others to avoid being ashamed of one’s self. It’s a willingness to harden our hearts rather than humble them, to become calloused to the hurts we inflict on others to the point that we delight in laughing at their pain. If you are tempted to become this person, please, don’t. If you have been a sympathizer or a source of approval for this type of person, stop. There are some who have probably read these thoughts with a smirk on your face. If you share them, it will only be to advertise your disgust or ridicule. I have hesitated to share them myself for several reasons. First, I’m ashamed of the time in my life I have described. I have no desire to glory in my shame. Second, I know that saying these things will probably make some people very angry, and while that is not my intention at all, it is inevitable. Scorners hate to be called out. Third, I don’t like being mocked any more than anyone else, probably far less. I expect that mocking will happen. But it needs to be said. If you’ve read this far, even if only so you can pick this apart and use it for ammunition to throw back at me, I challenge you to read to the end. God says that those who scorn will bear the results of their scorning. When the time comes for reaping what they have sown, the responsibility for their attitudes and actions will not fall on their parents, their pastors, their teachers, their friends, or anyone else they try to blame. God holds them personally responsible. They may see themselves as victims, but God does not (Pro. 9:12). If you are a scorner, I beg of you, let the fear and love of God change your heart. I assure you that a tender heart is far happier than a taunting one, and a broken heart is better than a bitter one. Desire God’s mercy rather than despising it. If you do not, one day you will reap the results of your scorning….alone. NOTE: I recently shared this as a series of posts on my Facebook page. If you would like to have the PDF version to download and print, it is available on my website free of charge. I hope that it will be a resource that will be helpful, and would be happy for you to print and share it. Please do not distribute it for any commercial purpose, or reprint/distribute in a different format without permission. Thank you! This entry was posted in Devotional Thoughts and tagged Bible study, Christian Compositions, mocking, Proverbs, rebel, scorner. Bookmark the permalink.